Ecogard XA5592 - Replaces: fram ca9997 purolator a35592 wix 46914 OE 16546-AA10A. Ecogard xa5592 compatible with 2005-2017 subaru outback, 2016-2017 subaru crosstrek, 2008-2016 subaru impreza, 2008-2014 subaru tribeca, 2014-2018 subaru wrx, 2006-2007 subaru b9 tribeca, 2005-2017 Subaru Legacy, 2009-2018 Subaru Forester, 2013-2015 Subaru XV Crosstrek, 2014-2018 Subaru WRX STI. Replaces: fram ca9997 purolator a35592 wix 46914 OE 16546-AA10A. Specifically engineered and tested for subaru oe original equipment engine air filter's fit, form, and function. Compatible with 2005-2017 subaru outback, 2013-2015 subaru xv crosstrek, 2006-2007 subaru b9 tribeca, 2016-2017 subaru Crosstrek, 2005-2017 subaru legacy, 2008-2016 subaru impreza, 2009-2018 Subaru Forester, 2008-2014 Subaru Tribeca. 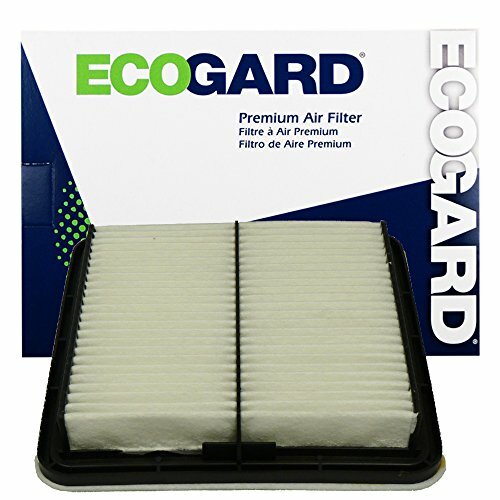 ECOGARD XA5592 Premium Engine Air Filter Fits Subaru Outback, Forester, Impreza, Legacy, XV Crosstrek, Crosstrek, B9 Tribeca, Tribeca, WRX, WRX STI - Improve performance by changing your vehicle's air filter at least every 12, 000 miles or as recommended in your car owner's manual; to ensure your vehicle's engine has the clean and efficient air flow it needs for fast acceleration and long term power. Avoid increased engine wear caused by dirty air intake filters that may allow damaging particles to get into the engine. Factory fit for easy installation. Ecogard XC36115 - If your vehicle is exposed to a considerable amount of road debris, ECOGARD recommends changing your cabin air filter once in the Spring and Winter. Custom installation instructions included Improves air quality in your vehicle by 99. 5% all products are designed with the installer in mind premium filtering efficiency Compatible with 2009-2018 subaru forester, 2013-2015 subaru xv crosstrek, 2014-2018 subaru wrx sti. Car manufacturers recommend changing your cabin air filter every 12, 000-15, 000 miles. Installations, depending on your vehicle, can take as little as five minutes. Doesn't fit 2017 and 2018 subaru impreza, 2014-2018 subaru wrx, 2008-2016 subaru Impreza, 2016-2017 Subaru Crosstrek, instead use Ecogard XC10622. ECOGARD XC36115 Premium Cabin Air Filter Fits Subaru Forester, Impreza, XV Crosstrek, Crosstrek, WRX, WRX STI - Removes and filters 99. 5% of all dust, pet dander, pollen, allergens, air pollution, and other airborne contaminants from the outside air before it reaches the vehicle's interior. Helps prevent premature wear on your car's hvac air conditioning and heating system blower by promoting good airflow inside the car. Do you have a musty odor in your vehicle? Do you have allergies? Is your vehicle exposed to a large amount of road dust? Try changing your cabin air filter. Replace per manufacturer recommendations or when existing cabin air filter inhibits airflow. Installs easily with included instructions - only takes a few minutes in most cars. Specifically engineered and tested for subaru oe original equipment cabin air filter's fit, form, and function. TYC 800122P - Replace per manufacturer recommendations or when existing cabin air filter inhibits airflow. Installs easily with included instructions - only takes a few minutes in most cars. Specifically engineered and tested for subaru oe original equipment cabin air filter's fit, form, and function. Oe-comparable configuration as either Particle filter single-stage or Combination filter with additional carbon layer to remove odor. TYC 800122P Subaru Replacement Cabin Air Filter - Compatible with 2009-2018 subaru forester, 2013-2015 subaru xv crosstrek, 2014-2018 subaru wrx sti. Doesn't fit 2017 and 2018 subaru impreza, 2014-2018 subaru wrx, 2008-2016 subaru Impreza, 2016-2017 Subaru Crosstrek, instead use Ecogard XC10622. Removes and filters 99. 5% of all dust, pet dander, air pollution, pollen, allergens, and other airborne contaminants from the outside air before it reaches the vehicle's interior. Helps prevent premature wear on your car's hvac air conditioning and heating system blower by promoting good airflow inside the car. Potauto MAP 1036W - Check & replace filter if peculiar smell / odors emit from the cabin air outlets, Trademarks & Model Numbers remain the property of their respective owners. 3 increase safety through reduced deposits in the fan or on the windscreen, Exhaust Gas, Pollen, and protect air conditioning performance. Competitor cross reference part numbers for reference only, 3603013, pc6115, auto part source aq1149, ptc 3690, ecogard xc36115, subaru 72880fg000, 49359, service camp c36115, tyc 800122p, mobil / luber finer caf1869p, gki cf1180, warner wcaf1869, caf218p, f4030, atp cf-194, 616-49359, denso 454-2001, wix 24030, premium guard pc6115, please check size: ATP RA-101, 90218P, Valvoline VCA-1055. Change filter every 12 months or 12, or humming, or if the vehicle hvac system operates with poor performance, or weak air volume. Doesn't fit 2017 and 2018 subaru impreza, 2014-2018 subaru wrx, 2016-2017 subaru Crosstrek, 2008-2016 Subaru Impreza, instead use Ecogard XC10622. Removes and filters 99. 5% of all dust, pollen, allergens, air pollution, pet dander, and other airborne contaminants from the outside air before it reaches the vehicle's interior. POTAUTO MAP 1036W CF10930 High Performance Car Cabin Air Filter Replacement for AUDI, SUBARU, CROSSTREK, FORESTER, IMPREZA, WRX, WRX STI, XV CROSSTREK - Helps prevent premature wear on your car's hvac air conditioning and heating system blower by promoting good airflow inside the car. Replace per manufacturer recommendations or when existing cabin air filter inhibits airflow. Installs easily with included instructions - only takes a few minutes in most cars. Ecogard XC25851 - Compatible with 2009-2018 subaru forester, 2013-2015 subaru xv crosstrek, 2014-2018 subaru wrx sti. 2 improved concentration and driving comfort due to high air quality in the cabin. Replace per manufacturer recommendations or when existing cabin air filter inhibits airflow. Installs easily with included instructions - only takes a few minutes in most cars.
. Legal disclaimer: the Brand name & Model # if listed are for cross reference only. Check & replace filter if peculiar smell / odors emit from the cabin air outlets, Trademarks & Model Numbers remain the property of their respective owners. Compatible with 2007-2017 toyota camry, 2006-2017 toyota rav4, 2007-2017 toyota tundra, 2008-2017 toyota highlander, 2010-2017 subaru Outback, 2010-2015 Toyota Prius, 2011-2017 Toyota Sienna, 2009-2017 toyota corolla, 2005-2018 Toyota Avalon. ECOGARD XC25851 CF10285 Toyota, Lexus & Subaru Cabin Air Filter - Removes and filters 99. 5% of all dust, air pollution, allergens, pollen, pet dander, and other airborne contaminants from the outside air before it reaches the vehicle's interior. Helps prevent premature wear on your car's hvac air conditioning and heating system blower by promoting good airflow inside the car. Doesn't fit 2017 and 2018 subaru impreza, 2014-2018 subaru wrx, 2016-2017 subaru Crosstrek, 2008-2016 Subaru Impreza, instead use Ecogard XC10622. Removes and filters 99. 5% of all dust, air pollution, pet dander, allergens, pollen, and other airborne contaminants from the outside air before it reaches the vehicle's interior. Potauto MAP 1036C - Doesn't fit 2017 and 2018 subaru impreza, 2008-2016 subaru impreza, 2014-2018 Subaru WRX, 2016-2017 Subaru Crosstrek, instead use Ecogard XC10622. Removes and filters 99. 5% of all dust, allergens, air pollution, pet dander, pollen, and other airborne contaminants from the outside air before it reaches the vehicle's interior. Helps prevent premature wear on your car's hvac air conditioning and heating system blower by promoting good airflow inside the car. Legal disclaimer: the brand name & replace filter if peculiar smell / odors emit from the cabin air outlets, or if the vehicle HVAC system operates with poor performance, Trademarks & Model # if listed are for cross reference only. POTAUTO MAP 1036C Heavy Activated Carbon Car Cabin Air Filter Replacement compatible with SUBARU FORESTER IMPREZA WRX XV CROSSTREK - 2 improved concentration and driving comfort due to high air quality in the cabin. 3 increase safety through reduced deposits in the fan or on the windscreen, Bacteria, and protect air conditioning performance. Competitor cross reference part numbers for reference only, pc6115, atp cf-194, wcaf1869, gki cf1180, 616-49359, 49359, 3690, tyc 800122p, denso 454-2001, c36115, caf218p, please check size: atp ra-101, 3603013, caf1869p, 90218p, F4030, 72880fg000, 09-14 Subaru Forester 2. 5l-h4. Change filter every 12 months or 12, 000-15, or humming, or weak air volume. Replace per manufacturer recommendations or when existing cabin air filter inhibits airflow. Installs easily with included instructions - only takes a few minutes in most cars. Subaru SOA868V9270 - Replace per manufacturer recommendations or when existing cabin air filter inhibits airflow. Installs easily with included instructions - only takes a few minutes in most cars. Specifically engineered and tested for subaru oe original equipment cabin air filter's fit, form, and function. Oe-comparable configuration as either Particle filter single-stage or Combination filter with additional carbon layer to remove odor. Genuine Subaru SOA868V9270 Super Coolant - Spec. 9. 25" length, 8. 66" width, 2. 17" height; three-layer fabric ; Installation instructions included. Applications where used: audi s3 17-18; subaru crosstrek 16-17, wrx sti 13-18, forester 09-16, impreza 08-16, 18, wrx 12-19, xv crosstrek 13-15 See Amazon Part Finder for fitments to your cars. Benefits: 1 reducing at least 98% of these contaminants dust, particles of 5-100 microns. EPAuto FC-010-3 - Eliminates need for additional corrosion inhibitors. 3 increase safety through reduced deposits in the fan or on the windscreen, Bacteria, and protect air conditioning performance. Competitor cross reference part numbers for reference only, pc6115, caf1869p, wcaf1869, 616-49359, 49359, 90218p, tyc 800122p, f4030, c36115, atp cf-194, please check size: atp ra-101, GKI CF1180, 72880fg000, 3690, denso 454-2001, caf218p, 3603013, 09-14 Subaru Forester 2. 5l-h4. Change filter every 12 months or 12, or humming, 000-15, or weak air volume.2 improved concentration and driving comfort due to high air quality in the cabin. Check & model Numbers remain the property of their respective owners. Provides cold-weather protection to -62 Degree F. Compatible with non-metal surfaces. 2 Pack - EPAuto CP285 CF10285 Replacement for Toyota/Lexus/Scion/Subaru Replacement Premium Cabin Air Filter includes Activated Carbon - Clean air for driver and passengers. 3 increase safety through reduced deposits in the fan or on the windscreen, Exhaust Gas, Pollen, and protect air conditioning performance. Competitor cross reference part numbers for reference only, subaru 72880fg000, f4030, warner wcaf1869, service camp c36115, 616-49359, auto part source aq1149, gki cf1180, caf218p, premium guard pc6115, ptc 3690, ecogard XC36115, denso 454-2001, wix 24030, pc6115, atp cf-194, please check size: ATP RA-101, mobil / luber finer caf1869p, 90218P, 3603013, 49359, TYC 800122P, Valvoline VCA-1055. Change filter every 12 months or 12, or if the vehicle hvac system operates with poor performance, or humming, or weak air volume.2 improved concentration and driving comfort due to high air quality in the cabin. Subaru 15208AA15A - Legal disclaimer: the Brand name & Model # if listed are for cross reference only. Doesn't fit 2017 and 2018 subaru impreza, 2016-2017 subaru crosstrek, 2014-2018 Subaru WRX, 2008-2016 Subaru Impreza, instead use Ecogard XC10622. Removes and filters 99. 5% of all dust, air pollution, pet dander, allergens, pollen, and other airborne contaminants from the outside air before it reaches the vehicle's interior. Helps prevent premature wear on your car's hvac air conditioning and heating system blower by promoting good airflow inside the car. This is not an aftermarket part. 2 improved concentration and driving comfort due to high air quality in the cabin. Ensure fit using ECOGARD's online catalog. Specifically engineered and tested for jaguar, land rover, form, subaru, Lexus, Toyota OE original equipment cabin air filter's fit, scion, Pontiac, and function. Subaru 15208AA15A Oil Filter - Spec. 9. 25"" length, 8. 66"" width, 2. 17"" height; three-layer fabric ; Installation instructions included. Applications where used: subaru forester 15-09, wrx 15-14, impreza 15-08, xv crosstrek 15-13 See Amazon Part Finder for fitments to your cars. EPAuto AUTO-CF-002V2 - Oem. From the air passing through the filter & entering the interior of the vehicle. Eliminates need for additional corrosion inhibitors. Contains soda and carbon to generate fresh breeze air. Legal disclaimer: the Brand name & Model # if listed are for cross reference only. Compatible with non-metal surfaces. This is not an aftermarket part. EPAuto CP285 CF10285 Toyota/Lexus/Scion/Subaru Premium Cabin Air Filter includes Activated Carbon - From the air passing through the filter & entering the interior of the vehicle. Best in quality. Durable. Epauto cabin air filter provides clean air for driver and passengers, contains soda and carbon to generate fresh breeze air. 2 improved concentration and driving comfort due to high air quality in the cabin. Required for use in all warranty repairs. 3 increase safety through reduced deposits in the fan or on the windscreen, Exhaust Gas, Pollen, and protect air conditioning performance. FRAM CF10285 - Keeps damaging particles from entering the engine and causing increased engine wear. All brands, 000 miles. Durable. Protects against corrosion with organic corrosion inhibitor. Contains soda and carbon to generate fresh breeze air. Enhanced hvac performance, Recommended replacement every 12 months or 12, 000 miles. Replacement for fram cf10285, 87139-50060, 87139-52020, replacement toyota genuine part # 87139-02090, 87139-52040, 87139-06040, 87139-07010, 87139-50100, 87139-YZZ08. Filters up to 98% of dust, pollen, and are used in approximately 80% of the vehicles built since the 2000 model year. Replacement for fram cf10285, 87139-52020, 87139-07010, 87139-50060, toyota genuine part # 87139-02090, 87139-50100, 87139-06040, 87139-52040, 87139-yzz08, 87139-YZZ10. FRAM CF10285 Fresh Breeze Cabin Air Filter with Arm & Hammer - Genuine oem factory part. Plus, it’s the only cabin air filter with Arm & Hammer baking soda and activated carbon embedded in the filter media that can help remove odors flowing through the vehicle ventilation system. 2 improved concentration and driving comfort due to high air quality in the cabin. Clean air for driver and passengers. Legal disclaimer: the Brand name & Model # if listed are for cross reference only. This is not an aftermarket part. Required for use in all warranty repairs.